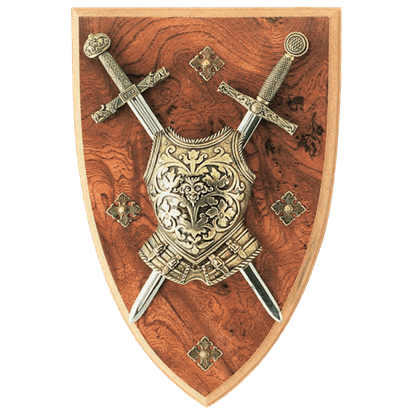 Perfect for showing off a panoply of medieval weaponry and armour, our arms and armour display plaques offer a stylish way to decorate your home or office with medieval flair. 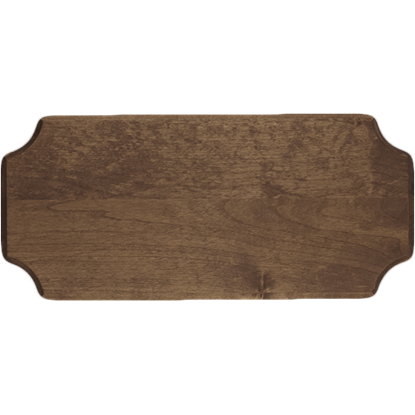 Our wooden plaques are crafted with exquisite care, many formed into shields with intricate designs. 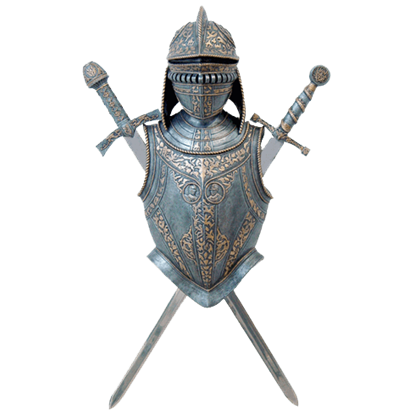 Many feature crossed swords, axes, and other historical weapons, as well as breastplates and shields. A number of these designs have been created in miniature and can also be used to hold keys or other small items on pegs. 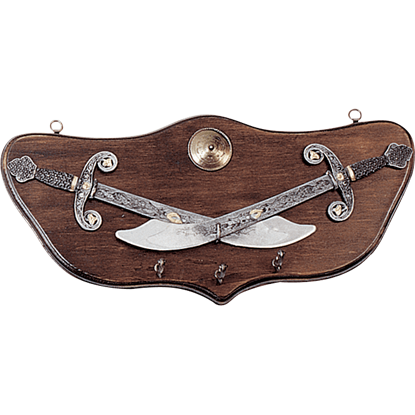 Check out our fantastic sword wall mounts in the style of King Arthur, El Cid, Charlemagne, Napoleon, and more. 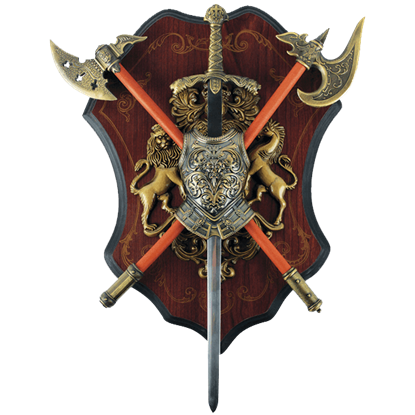 The heraldry found on the Battle Axes with Mini Sword Display Plaque bespeaks a house that values bravery and strength. Be you a medieval knight or a modern warrior, you will be pleased with the historic appeal of this wall decor. Share in your enthusiasm for firearms and history with the Dark Wood Replica Pistol Display Frame. 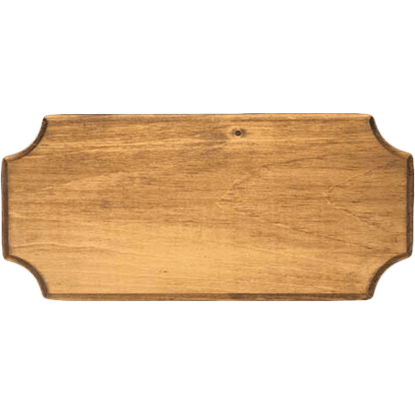 This wall plaque allows the collector to easily showcase an antique firearm or historical replica for everyone to appreciate and admire. Showcase a reproduction rifle inspired by the outlaws of the Wild West or a sword modeled after a historical piece from the Middle Ages. Keep said weaponry proudly mounted to the wall with the Dark Wood Replica Rifle Display Frame. 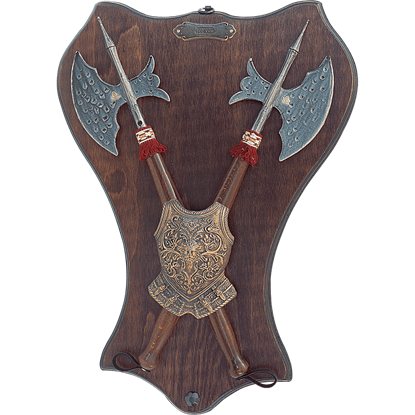 Featuring a matching pair of decorative war axes and a miniature ornamental breastplate, the Dual Axes Display Plaque is a wonderful wall decoration that is perfect for displaying your interest in the weaponry of the medieval era. This miniature sword plaque had the Excalibur and Charlemagne Mini swords behind an decorative armour breastplate. 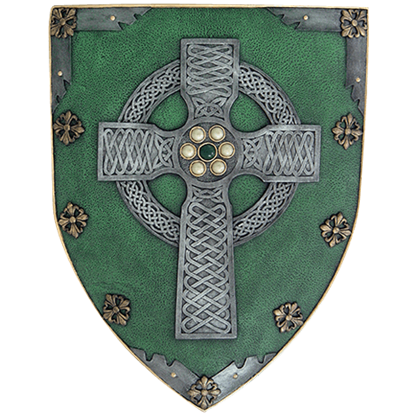 The display plaque is made of wooden and the breastplate and swords are made of cast metal. This wooden plaque has the Excalibur and El Cid Mini swords behind a decorative armour breastplate. 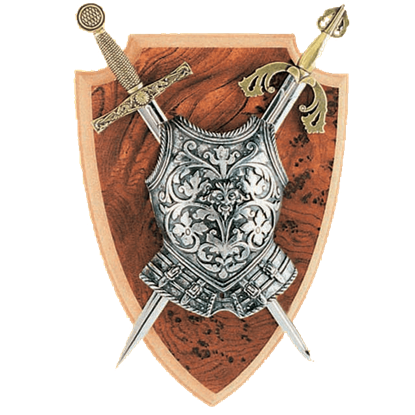 The Excalibur and El Cid Mini Two Sword Plaque is shaped like a shield. The wood-grained plaque forms a rich setting for this panoply. 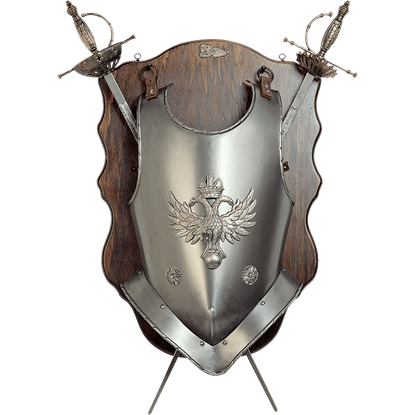 Capable of transforming the decor of any room in which it is displayed, the Heraldic Eagle Breastplate with Two Decorative Swords Wall Plaque is a magnificent means to display your passion for the Age of Enlightenment. 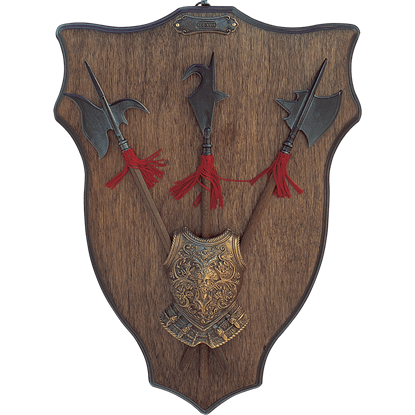 Exquisitely displaying a look of Renaissance weaponry, the Heraldic Halberds Display Plaque is a spectacular decor piece. This plaque displays a set of three scale model polearms and a miniature ornamental breastplate. Turn any home into a medieval castle with the Knight Armour Plaque. This wall statue, made of high quality cold cast resin, depicts a beautiful arrangement of an ornate helmet, breastplate, and two matching decorative swords. 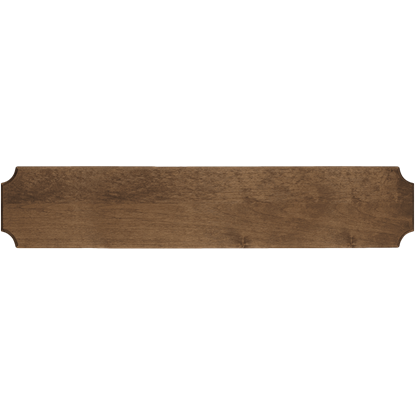 Show off an antique or reproduction firearm with the Light Wood Replica Pistol Display Frame. Whether you collect the weaponry of the Old West or the modern era, this simple plaque keeps these treasured items where all may admire them.